About three weeks ago I cast on to knit #06 Feather and Fan Dress from Vogue Knitting, Spring/Summer 2009. After a handful of false starts and one complete change of direction, the project — now a top instead of a dress — is complete. This has been a heck of a project. Most of the issues were of my own making and come back to trying to make the pattern work with a limited quantity of certain stash yarns. I think those types of challenges are often where the fun comes in; there isn’t any creativity involved in copying a pattern exactly as it’s written. As much as I enjoy putting my own spin on a pattern, however, this one took a lot out of me. If you’ve been following the posts regarding this project, you already know most of the challenges. This week, I learned that there are some issues with the pattern itself. 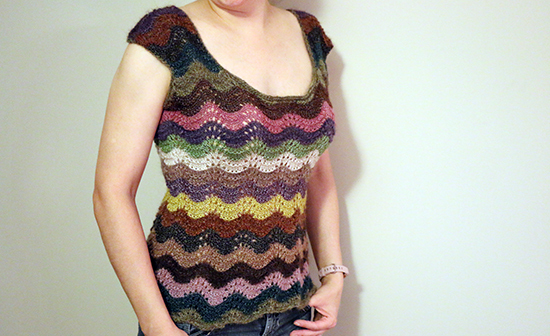 Before casting on, I saw a lot of knitters on Ravelry comment that the instructions for the shoulders are incorrect. I expected the errata to address that issue, but they don’t. My stitch counts, accurate up to that point, didn’t match the shoulder instructions and I had to make up those stitches to some extent as I went along. 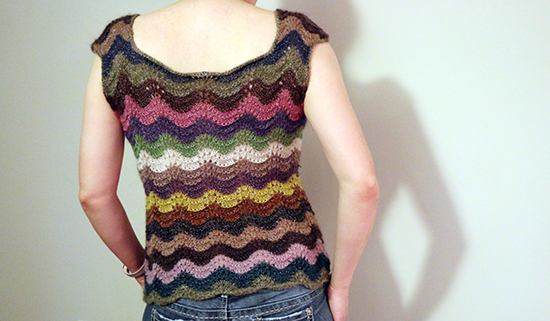 As the shirt came off the needles, I could see that it was shorter than I previously thought. Thankfully, a good soak loosened up the fibers enough to add just the right amount of length. All of my concern that the top might end up too tight was unfounded; the fit is just right. Despite my struggles, I would recommend this pattern — but only to knitters who have enough experience to reconstruct the shoulders. It’s a shame, because the rest of the pattern is easy enough for most beginners and would be a lovely way to branch out from standard beginner projects. As far as the stash yarn I was trying to use up, I knit through quite a bit of it. I’ll be able to quickly add a handful of squares to my ongoing scrap blanket with the remainder. How have you been using up stash yarn recently?